Café Kevah is open from 9am to 4pm (food service stops at 3:30) from President's weekend through the New Year. They do not accept reservations. EVERYONE told us to go to Nepenthe -- so we did! However, the wait was long and we were wanting brunch (of course! ), especially after a morning hike took us into early afternoon. Luckily, Cafe Kevah, the lower deck of Nepenthe, serves just that, and all day! We did enjoy a fabulous Bloody Mary and Margarita at Nepenthe while deciding which food direction to go. This place is popular so parking was a challenge! Be prepared to circle the lot a few times. In continuing with our (ok my) California theme - I ordered the Cafe Kevah Benedict. A classic Benedict with Dungeness crab and avocado. It is honestly hard to write about because it was so good it actually hurts a little just thinking about it. The Breakfast Burrito came highly recommended by the staff, enough so that it swayed Ann into ordering it. This is an uncharacteristic order for her! The risk was worth it and it was amazing. So amazing (her words exactly!). Since it was late afternoon when we got settled and we'd already had cocktails at Nepenthe, we decided on wine with our brunch, which was a lovely decision! All of this with a stunning, panoramic view of the Pacific coast. The sun was shining, sweet little birds were hopping around, amazing food, and my favorite companions. Top three brunches of all time. We are struggling to name the others. Good for kids or dogs? Kids, yes, but could be a challenge if there is a long wait. No dogs allowed (except for in the Phoenix Shop - a quant gift store on the property). Don't miss the pastries (breakfast desert). They were in an unassuming display case by the register, not giving them the presentation they deserve. Our favorite was the pineapple turnover. Umm..glamping of course! Get all the details of our Big Sur trip here. 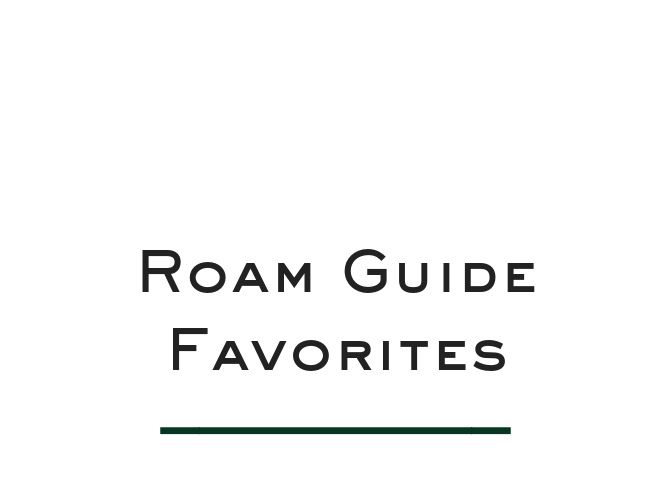 Curated travel guides to help you plan your next trip. In this Roam Guide we’ve narrowed down our favorites by neighborhood. We simply share the places worthy of consistent praise in small circles, highlighting solid, familiar, local favorites, worthy of repeat visits. Oh, Blackbird. Let us count the ways! Over the years, we have been big fans. BIG fans. You continue to delight us with with your food and ambiance. We challenged our contributors to pick their five favorite restaurants in Minneapolis and after much debate this is where they landed. The Linden Hills Neighborhood is filled with local shops and does a great job with events and dining, including our favorite, Tilia — only blocks from Lake Harriet if you need to walk off your French toast.